When Ginny Moon was released on May 2nd, I started getting a lot of e-mails from librarians in New Hampshire. A lot of folks from my home state were talking about the book. Even more exciting was that quite a few of the librarians asked if I could come to their libraries to give a book talk. I said yes, every time. As a result, I have quite a few NH library events scheduled for this summer. And I’d love to have more – so if you’re a NH librarian, please feel free to reach out to me at [email protected]. Schedule permitting, I’d be glad to come to your town and talk with readers about Ginny Moon. And if you’re not from NH, please know that I’m also scheduling a lot of Skype appearances. If you’d like to set one up, please send me an email, and we’ll see what we can do! 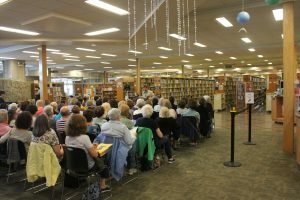 Here I am, by the way, at a book talk hosted by East Meadow Public Library on Long Island. Hi, I finished reading Ginny Moon. It was amazing. I had wanted to write a book about my autistic granddaughter who is non-verbal, and you taught me how to give her a voice. My target market will be school-aged children who may have difficulty dealing with an autistic classmate. Hi June! I just saw your email, and replied to it. What a great idea, to write about your granddaughter! I wish you the best of luck with the project. Definitely read everything at http://www.agentquery.com — there’s a wealth of information there about the writing industry.